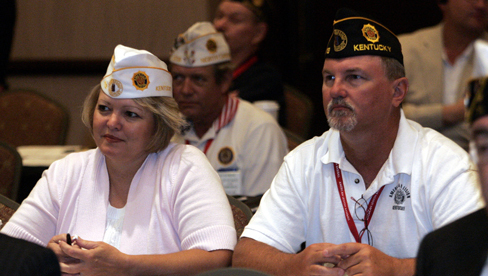 The American Legion’s fifth annual Children & Youth Conference, held Sept. 16-18 in Indianapolis, focused on the overall well-being of today’s youth, especially military children. Between presentations from Child Welfare grant recipients to Legion financial assistance programs, Legion family attendees walked away with ideas on how to better protect and support our nation’s children and youth. In particular, thanks to Sesame Workshop, attendees became aware of ways to assist the more than 12,000 military children grieving the loss of a parent. “When Families Grieve” is an outreach kit that helps children reduce anxiety, sadness and/or confusion they may be experiencing with the loss of a parent. The kit comes in two family versions, military and non-military, and contains a parent/caregiver guide, a children’s storybook and a DVD that features a Muppet story and live-action family documentaries. To order a free kit, please email grief@sesame.org and specify which version is needed. For additional materials on sharing and talking, finding comfort and moving forward, visit www.sesamestreet.org/grief. Further presentations were conducted on how to fill out the Legion’s Temporary Financial Assistance forms, help military children become involved in extracurricular activities, prevent Internet crimes against children, and educate childhood cancer survivors of long-term effects. Visit www.legion.org in the coming weeks to read more about these presentations. For those unable to attend the 2011 Children & Youth Conference, PowerPoint presentations can be downloaded by clicking here.